New Delhi, India’s economy grew at 7.1 per cent in July-September, lowest in three quarters, but still remained ahead of China to retain the tag of the world’s fastest growing major economy. The Gross Domestic Product (GDP) at constant prices (2011-12) had grown at 6.3 per cent in July-September quarter of the last fiscal, according to government data released Friday. The size of the GDP in the second quarter of 2018-19 is estimated at Rs 33.98 lakh crore, as against Rs 31.72 lakh crore a year ago, showing a growth rate of 7.1 per cent, as per a statement of the Central Statistics Office (CSO). Indian economy grew at 8.2 per cent in April-June quarter of this fiscal. 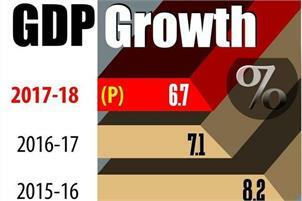 The GDP growth was 7.7 per per cent in January-March quarter while it was at 7 per cent in October-December. India’s GVA (gross value added) at Constant (2011-2012) Prices for second quarter this fiscal is estimated at Rs 31.40 lakh crore, as against Rs 29.38 lakh crore year ago, showing a growth rate of 6.9 percent over the corresponding quarter of previous year. The CSO said that mining and quarrying output has declined by 2.4 per cent in the quarter from a growth of 6.9 per cent in year ago period. However, the manufacturing activities expanded at the rate of 7.4 per cent in the quarter under review up from 7.1 per cent in the year ago quarter. The construction sector too showed an improvement by recording a growth of 7.8 per cent as against 3.1 per cent earlier. The farm sector too grew at a higher rate of 3.8 per cent in the quarter as against 2.6 per cent a year ago.